In 1 1/2-quart saucepan, vigorously stir 3 egg yolks and lemon juice with wire whisk. Add 1/4 cup of the butter. Add MacYourelf cheese powder. Heat over very low heat, stirring constantly with wire whisk, until butter is melted. Add remaining 1/4 cup butter. Continue stirring vigorously until butter is melted and sauce is thickened. 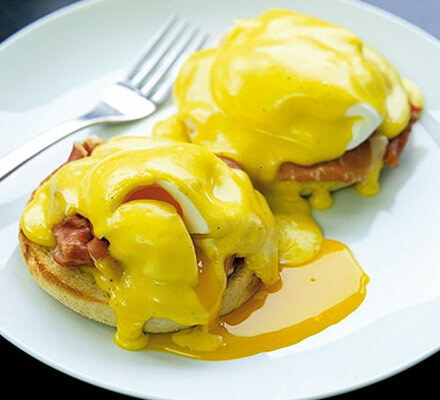 (Be sure butter melts slowly so eggs have time to cook and thicken sauce without curdling.) If the sauce curdles (mixture begins to separate), add about 1 tablespoon boiling water and beat vigorously with wire whisk or hand beater until it's smooth. Cover and place in a warm spot until ready to use for the eggs benedict . Toast an English Muffin. Heat a small, greased skillet over medium heat. Fry up a couple of pieces of deli ham, once done set them aside.